Our error. We are not an authorized dealer of this product and any warranty included with the product may not be honored by the manufacturer. Pickup hours Kansas City, MO 64120. We apologize for this inconvenience. They're enclosed by a UV-treated ABS enclosure, which is wall mountable and can swivel to send music where it's needed with the included multi-angle mounting brackets. Pair of 100 watt (50 watt RMS) speakers. Details about Enrock Marine 6.5" High Performance Speakers (Black / White / Charcoal). What should you be expecting when setting out to browse our website?. Such are the facts and this is what you could and should expect. Sleek styling and rugged construction make these our most popular outdoor stereo speakers for music around the pool, on a patio, or even on a boat. Hunting Camouflage Pattern Design Style. product summary. Outdoor Electronics Sale (5). Outdoor Covers (4). Power: 200 Watt Peak (100 Watt RMS). Connect & Stream Audio from External Devices. Waterproof Rated & Weather-Resistant. When designing your LU43PB high performance speakers we included all the components for high quality long lasting sound. Their compact but efficient design provides you with 100 Watts of Peak Power, 50 Watts RMS, 4-6 Ohms and Frequency Range between 100Hz-20kHz for unrivaled sound superiority. 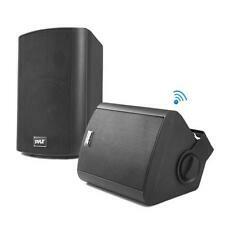 The Pyle PDWR51 mountable speaker systems provide high-powered wireless Bluetooth performance -- indoors or out! Featuring rugged marine grade waterproof construction, they are the perfect choice for adding full range stereo sound on boats, decks, patios or backyards. Dual - LU53PW. Outdoor Electronics Sale (10). Outdoor Covers (45). RMS Power: 60 Watt / PEAK: 125W. 25mm polypropylene cone midrange. Details about Enrock Marine 6.5" High Performance Speakers (Black / White / Charcoal). As a full service dealer we have access to all the top manufacturers in the industry. Item is New in box. The box has not been opened. Wireless Components. The Klipsch Compact Performance Series CP-6 is a versatile speaker that brings powerful musical sound quality wherever you desire, indoors or out. Utilizing proprietary Tractrix Horn technology for unmatched clarity and detail and a premium, long-throw woofer the sound is rich and dynamic well beyond its compact size. The new bracket design combined with front-access speaker terminals assures a clean, easy, one-screwdriver installation with the ability to tuck in a corner for a custom look. Powered by Solid Commerce The [All-in-One Listing, Inventory & Order Management Solution ] (https://pages.ebay.com/seller-center/listing-and-marketing/third-party-listing-tools.html#solid-commerce) for Online Merchants Protect Your Product With a Consumer Priority Service Warranty. The proprietary 90° x 90° Tractrix Horn provides for unmatched low-distortion clarity and detail while the long-throw woofer combines with front-firing ports for amazingly powerful low frequency response wherever they are located. Speakers are both used with wear wear. Gil's Loans is located in Hamilton, Ohio and has been serving the community for over 40 years. NO: PB100155.